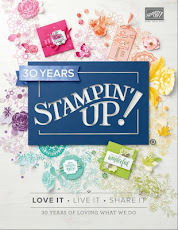 I'm still drooling over the stamp sets and dies that are part of the Snowflake Showcase promotion that Stampin' Up! will be offering all it's customers starting November 1. It's a limited time offer that ends at the end of November, however, so be prepared to act quickly, because it's while supplies last as well, and I have a feeling this one is going to be very popular. 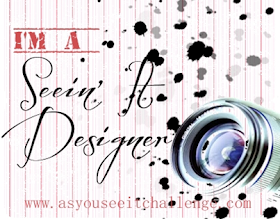 First, it's beautiful with so many detailed and amazing images and dies, and second, it's versatile. 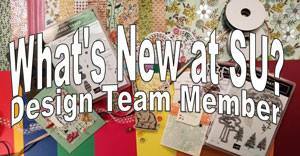 Between the two stamp sets, it will keep you going all year long and the dies coordinate with both. So far, I just have the Snow is Glistening stamp set and the Snowfall Thinlit Dies, but I may spring for the other set, called Happiness Surrounds, soon. It would ensure that I got the most out of my die set. In the meantime, I've been posting other samples to my Snowflake Showcase Pinterest Board for your chance to see all the possibilities. I wanted to make another sample to show you some of the other images that come in the Snow is Glistening photopolymer stamp set and one of my favourite die cuts made from the beautiful White Velveteen Sheets that you can also purchase as part of this promotion. 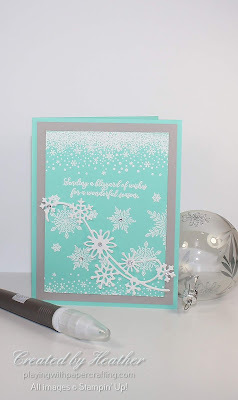 I really love the border stamp that is part of the Snow is Glistening set. It kind of reminds me of a snow globe just after you shake it and the 'snow' starts to fall to the bottom of the globe. I used the same stamp at the bottom of the front panel as well, just not as much of it. 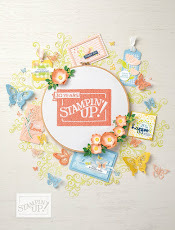 The image is stamped in Versamark and embossed using White Stampin' Emboss Powder. The super sentiment is also from the Snow is Glistening set. There are several I really like in this set. I also embossed 4 sizes of snowflakes on the front panel. The snowflake flourish that you see is my favourite die from the Snowfall Thinlit dies. It looks just like a gust of wind whirling the snow around. I like how each snowflake is different. 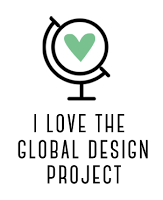 I have die cut it from the White Velveteen Sheets that are part of this promotion. I know that you can't tell the difference from Whisper White cardstock in this photo, but in real life, it looks soft and feels softer! 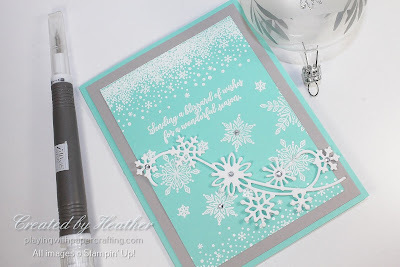 On my card, I used small pieces of Mini Stampin' Dimensionals to pop it up over the embossed snowflakes behind. I added some Rhinestone Basic Jewels to draw the eye to it over the background snowflakes.